The previously reported Samsung Propel has been released by AT&T. The QWERTY keypad device is an answer to the increased messaging services that the industry has been seeing and is one of the four QWERTY devices that were scheduled to be released by AT&T. The Propel comes with a 1.3-megapixel camera and supports dual-band UMTS and quad-band GSM/GPRS. The device also comes with VideoShare calling and AT&T Navigator. It is available in blue and green as of now with a price tag of $79.99 after a 2-year contract. The red and white ones will be released in the near future. This is a great option for someone that wants easy messaging without having to have a smartphone where the monthly service is more expensive. It looks really cool and fun. I wonder how big it looks in person. With that QWERTY keyboard, one could mistake it for a smartphone if they didn't examine the phone's OS. I'm still waiting on the Quickfire. According to dimensions I found on the net, it measures smaller than a blackberry curve, for a frame of reference. 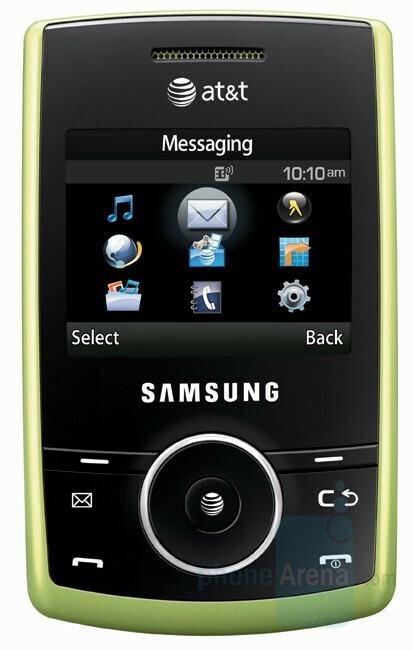 Look up the Samsung SGH-i620. It's the same phone with WinMo SP. Everywhere says that this phone is available even the att site, yet no stores have them. hey is this phone a smartphone? Alot of sites say yes, but from what I've heard and seen on this site I'm guessing no.Also ist this one better than the matriz or quickfire? no its not. idk when is the review for all of these phones coming out? So, this looks awesome, but MASSIVE! I'm wondering that if i get it that when im texting that it will be off balanced because of the slider design. It just looks clunky. IDK!! i can decide! Quickfire, propel, matrix, pearl, or the Q. HEEEEEEEELLLLLLLLPPPPPPPP!!!!!!!! When will att get a real keyboard phone? I hate verizon, but the envy kills any slider than att comes out with.